Growing prevalence of zoonotic diseases is projected to boost demand for veterinary chemistry analyzer globally. In addition, increasing demand to test animal-derived food products is projected to impact the global market growth of veterinary chemistry analyzers positively. 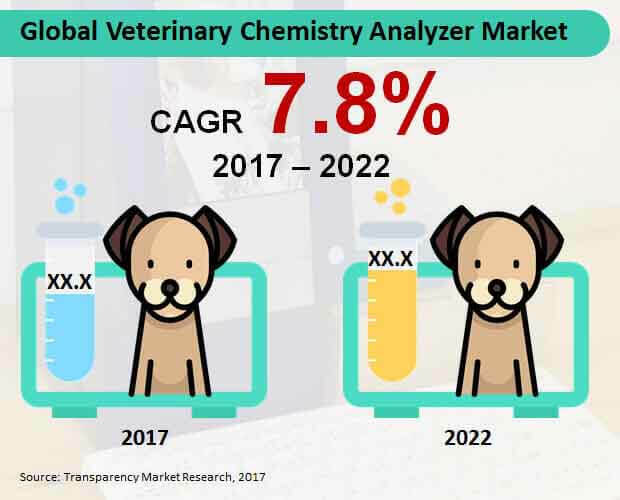 Transparency Market Research states that the global market of veterinary chemistry analyzer is projected to reflect a CAGR of 7.8% over the forecast period, 2017-2022. Growth of the global veterinary chemistry analyzers market is mainly bound to various macro-economic and micro-economic factors. Increasing population of various animals is projected to impact the global market growth of veterinary chemistry analyzer. Surge in the pet adoption is further expected to fuel demand for pet insurance and healthcare maintenance. Moreover, prevalence of diseases has further led to increasing awareness about animal healthcare globally. With the increasing awareness related to animal healthcare, demand for veterinary chemical analyzers is likely to contribute towards the global market growth. Surge in demand for animal healthcare has further led to growing number of practitioners in the veterinary hospitals and clinics. Growing need to maintain animal healthcare is projected to rev up the sales of veterinary chemical analyzer in the global market. Growing need for conducting the hematology tests will further continue to impact the global market growth over the forecast period. As requirement for delivering accurate results and maximizing the testing facilities arises, sales for veterinary chemistry analyzer is likely to remain high globally. Increasing preference to consume animal derived edible products is further expected to boost demand for veterinary chemistry analyzer in the food industry. With the growing need to eliminate the illegal residue and contamination increases, demand for veterinary chemical analyzers is projected to increase. Imposition of regulations by FDA regarding the elimination of illegal residue and contamination in the animal food product is projected to impact the global market growth of veterinary chemistry analyzers positively. Veterinary chemistry analyzers are further used for testing various animal derived medications and prevalence of zoonotic diseases. Increasing demand for testing prevalence of various diseases in the animals is projected to contribute towards the global market growth of veterinary chemistry analyzers over the forecast period. Demand for veterinary chemistry analyzer continues to gain momentum in the global market bound to increasing prevalence of zoonotic diseases globally. A recent study by CDC reveals that tens of thousands of the Americans will fall sick due to the zoonotic diseases, which are diseases that spread between the people and animals. E.Coli infections, dengue, salmonella infection, malaria and chikungunya are some common zoonotic diseases. WHO recently revealed that malaria caused 429,000 deaths and 212 million clinical incidences in 2015. With the growing need for the control measures for zoonotic diseases increases, sales of veterinary chemistry analyzer is projected to increase significantly. Increasing demand for cheap and convenient rapid diagnostic test is projected to fuel the global market growth positively. Increasing preference for the edible animal derived products has led to an upsurge in demand for consumable products in the global market. Based on product type, the glucometer segment is projected to reflect a robust CAGR through 2022. In terms of revenue, the consumable product type segment is projected to represent a significant growth, recording more than US$ 180 Mn by 2022-end. Representing the fastest growth, the veterinary hospitals application segment is projected to represent more around US$ 180 Mn by 2017-end. Major players in the global market of veterinary chemistry analyzer are Alfa Wassermann, Inc., Abaxis, Inc., Arkray, Inc., Biochemical Systems International Srl, Diasys Diagnostic Systems GmbH, Chengdu Seamaty Technology Co., Ltd., Eurolyser Diagnostica GmbH, Elitechgroup, Idexx Laboratories, Inc., Randox Laboratories Ltd.